In any industry, monitoring where your business currently is and where it’s headed is imperative. If you want to be a genuinely proactive business, you need to look continually at the revenue you have coming in now and your expectations for revenue in the future. For insurance agencies, this is done by projecting commissions. Hire support staff—when will the agency need to and financially be able to hire more staff? Expand or maintain current client base—how much does an agent need to sell to reach their financial goal? Decide which products to sell—what products bring the agency substantial revenue? Does the agency need to expand into other areas of business? Identify new sales opportunities—how will expanding into a new market or simply selling more of the current products affect revenue? Find missed or inaccurate commissions—are there discrepancies between what the agency expected to receive vs. what was actually received? How does that affect future plans? Overall, the ability to project commissions helps agencies confirm they are receiving accurate payments on what they have sold, plan better for future events, and be more proactive in its operations. How do you project commissions? To project commissions, an agency takes its current commissions and forecasts them out over a set number of years. Commissions change year-to-year, so therein lies the importance of being able to see how those changes affect future revenue. The difficulty, however, is that this process can be extremely labor intensive if you’re doing it manually, like in an Excel spreadsheet. An agency has to take each of its policies and their respective commissions (often tied to more than one agent or agency) and forecast each based on its terms. Then, to get a whole agency view of total commissions, the agency has to add up all of those separate commissions. Not to mention, the agency would likely be interested in viewing the commissions split out between product types like health, life, Medicare supplement or dental. Or even further, the agency would be interested in seeing individual policies vs. group policies. So, because the information is extremely vital but getting the information manually takes too much time, it needs to be available within the agency management system that already contains valuable commissions data. AgencyBloc allows agencies to project commissions, analyze current vs. future revenue, and find missing commissions within its Commissions Module. 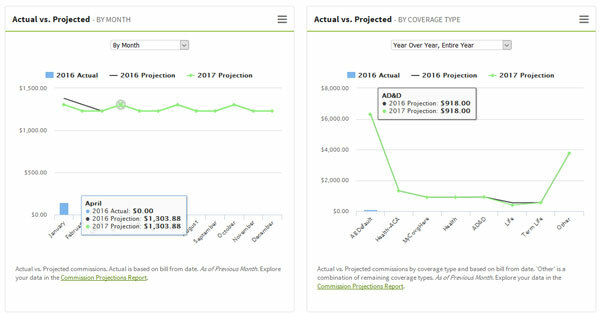 An agency can use “Projection Tables” to plan the commissions it expects to receive and to chart the growth path of its agency. Did I receive the amount I was expecting? How accurate are the commissions we are receiving from carriers? How will expected commissions affect the performance of our agency this year and years to come? How do my projected commissions affect future growth plans? Each agency’s needs are different, and conversations around commissions data can be complicated. The best way to see how this could benefit your agency is to sign up for a personalized demo where you can speak one-on-one with one of our sales associates (each with past experience in insurance sales) about your needs and take a peek inside the system for yourself. 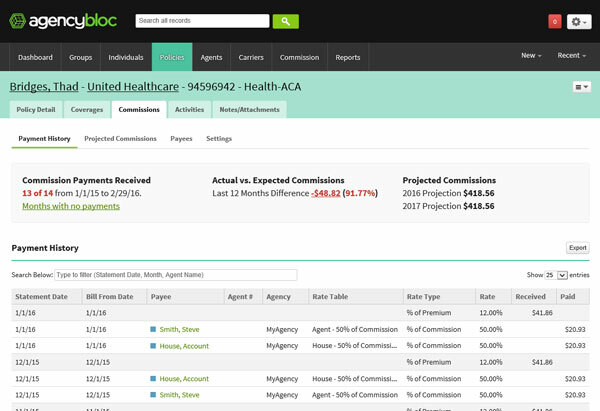 Want to see AgencyBloc's Commissions Module for yourself? The best way to discuss your agency's specific needs and see if our Commissions Module will meet your needs is to set up a one-on-one live demo.